Get caught up in the history of the Halo story up to Halo 4. In Shism, Urban Legend walks us through the last bit while we sit on the edge of our seats waiting for midnight. A small Covenant expeditionary force arrives at Earth in search of Forerunner relics. Not expecting massive resistance, it is quickly decimated by the UNSC Home Fleet. The assault carrier Solemn Penance, bearing the Prophet of Regret, breaks through the defenses and lands ground troops in the East African city of New Mombasa. Regret discovers a vast artifact under the savannah on the outskirts of the city; but also the co-ordinates for another Halo installation. His vessel retreats to its location, pursued by the UNSC In Amber Clad; under the command of Cdr. Miranda Keyes and with John-117, Cortana, and SgtMaj. Johnson aboard. Soon after, the Jiralhanae-led fleet of the Prophet of Truth arrives at Earth and begins to take control, unearthing the artifact. For his failure to protect Installation 04 from destruction, the Fleetmaster of the Fleet of Particular Justice, Thel ‘Vadamee, is given the chance to regain his honour as the Arbiter. He is informed of an outpost of heretics that openly shun the belief that the Forerunners achieved immortality. After defeating their leader, ‘Vadamee learns the source of these doubts is 343 Guilty Spark, whom he captures. Solemn Penance and In Amber Clad arrive at Installation 05, shortly followed by High Charity and its massive defense fleet. John-117 tracks down and assassinates the Prophet of Regret, but the defense fleet glasses his location in an unsuccessful attempt to avenge the Prophet. 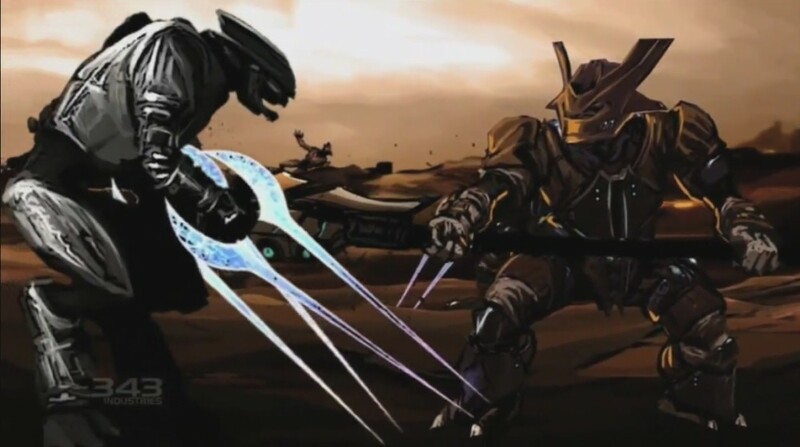 Using the death of a Hierarch to his advantage, the Prophet of Truth quickly supplants the Sangheili with the more subservient Jiralhanae as the military power of the Covenant. He and Mercy send ‘Vadamee to retrieve the Halo’s activation index, but also task Tartarus, chieftain of the Jiralhanae, with his execution. As a result, both John-117 and ‘Vadamee are captured by a Gravemind. The Flood has been loose on Installation 05 for millennia, and have constructed a physical embodiment of their central consciousness. The Covenant is in possession of the installation’s index, and have captured Cdr. Keyes and SgtMaj. Johnson to use in the activation process. The Gravemind concludes that none of the trio wish for the firing of the ring, and teleports his captives away to search for the index. John-117 and Cortana are sent to High Charity, whereas ‘Vadamee is sent to scour the Halo’s control room. The Flood takes control of In Amber Clad and use it to assault High Charity, infecting the Prophet of Mercy. The Spartan is unable to stop the index leaving the space station, but ‘Vadamee has better fortune when it arrives at the control room. He kills Tartarus, and halts the activation process. The installation emits an emergency pulse, priming the array for remote activation from the Ark. John-117 stows aboard the Forerunner keyship as it departs High Charity for Earth; Truth planning to use the artifact in Africa to generate a portal to the Ark. Cortana stays behind to detonate High Charity’s reactors and destroy Installation 05 if necessary. Dr. Halsey arrives at Onyx with Kelly-087, hoping to amend for her actions in creating the Spartan-IIs by protecting them and their successors. She finds Spartan-III Gamma Company, Kurt-051 and SCPO. Mendez engaging Forerunner sentinels roused by the destruction of Installation 04. Halsey sends a distress signal to Earth, requesting reinforcements in the shape of the remaining Spartan-IIs. They arrive, but are tailed by a large Covenant fleet. Onyx is revealed to actually be a shield world, and to escape the enemy the humans resolve to enter its interior. They do so, but Kurt-051 elects to stay behind and detonate two warheads to destroy the chasing Covenant forces, ensuring they cannot follow. John-117 ejects from Truth’s keyship upon its entry into Earth’s atmosphere, and is found in the African jungle by SgtMaj. Johnson. Truth uses the keyship to activate the portal and his fleet travels to the Ark. Immediately after, a Flood-infected vessel escapes quarantine at Installation 05 and slips to Earth, crash landing near the portal. Cortana has piggybacked a message on the ship, which John-117 retrieves before the Sangheili forces pursuing the vessel glass the area. Cortana has learned from the Gravemind that there is – at least what she believes to be – a solution to the Flood at the Ark. The Sangheili form an alliance of mutual interest with the UNSC, and send a combined fleet through the portal. ‘Vadam, John-117, 343 Guilty Spark, SgtMaj. Johnson, Cdr. Keyes and her frigate Forward Unto Dawn make the jump. High Charity arrives at the Ark shortly after, carrying the Gravemind and a Flood army. John-117 and ‘Vadam assassinate the Prophet of Truth before he can activate the Halo array, but cannot prevent the death of Cdr. Keyes. They learn that the Ark has built a new installation to replace the one John-117 destroyed; much to the delight of Guilty Spark. John-117 rescues Cortana from the infested High Charity and the clutches of the Gravemind. His plan is to use the activation index she still has from the first Halo to fire its replacement, wiping out the Flood once and for all. As this will destroy the new ring, Guilty Spark attempts to defend it by attacking the Spartan, killing SgtMaj. Johnson in the process. It is defeated by John-117, and the ring is activated. Forward Unto Dawn attempts to escape back through the portal, but it collapses; severing the ship in two. ‘Vadam arrives safely on Earth, but John-117 and Cortana are stranded somewhere in the vast unknown of space…. In the aftermath of the war, the head of ONI, ADM. Margaret Parangosky, forms ‘Kilo-Five’. The cell’s mission is to incite a civil war amongst the Sangheili, ensuring that they never rise to threaten humanity again. To this end, she instructs the cell’s leader, Cpt. Serin Osman, to provide arms to ‘Vadam’s opposition: ‘The Servants of the Abiding Truth’. During a meeting with ‘Vadam, former shipmaster Jul ‘Mdama disagrees with his policy of a peaceful treaty with humanity. ‘Mdama contacts the leader of the Abiding Truth, Avu Med ‘Telcam, and joins the group so that he can use their resources to assassinate ‘Vadam. Suspicious of ‘Telcam’s contacts, ‘Mdama secretly observes him picking up weapons from Kilo-Five, but is captured by the cell’s Spartan-II, Naomi-010. Dr. Halsey, SCPO. Mendez and the Spartans discover a group of Huragok in the Onyx shield world. After some coercion, they convince the Huragok to let them contact the UNSC. ADM. Parangosky dispatches Kilo-Five to arrest Halsey once the Huragok have transitioned the ‘Sharpened Shield’ from its slipspace bubble into real space. The remaining Spartans and SCPO. Mendez are returned to Earth for debriefing. ‘Telcam begins his attack on ‘Vadam’s keep. The Abiding Truth takes the upper hand in the conflict, forcing ADM. Parangosky to intervene to prolong the stalemate. ADM. Terrence Hood, commander of the Home Fleet, contacts the Arbiter and offers to intervene, to which ‘Vadam reluctantly agrees. The prototype warship, UNSC Infinity, is deployed to Sanghelios to demonstrate the human’s new-found might. The ship is a result of all the reverse-engineering ONI has done of Forerunner and Covenant technology, and as a result also houses some of humanity’s brilliant minds – including Dr. Halsey. It is the biggest and most heavily armed UNSC ship ever built. Infinity destroys several Abiding Truth vessels to tip the balance of the conflict in ‘Vadam’s favour. This leads Cpt. Osman to impersonate a renegade Kig-Yar ship with her own, and destroy several of ‘Vadam’s cruisers to even the odds. However, she cannot prevent one of his ships destroying a cruiser carrying the wife of Jul ‘Mdama, who had travelled to the front lines in search of her husband. Kilo-Five then proceeds to remove ‘Telcam from the battlefield, ensuring he lives to fight another day. The Servants of the Abiding Truth retreat, and for now ‘Vadam is victorious. Jul ‘Mdama is held captive at the ONI research facility within the Sharpened Shield. Unbeknownst to him, he is being used to test genetically modified foods native to Sanghelios, which ONI plans to seed to wipe the Sangheili out. Eventually, he is allowed to roam the shield world, albeit only whilst wearing an explosive safety harness in case he should attempt to escape. Whilst visiting Forerunner sites, ‘Mdama learns of the Didact and his hatred of humanity. His Huragok overseer explains that the Didact still lives, in meditative exile somewhere called ‘Requiem’. Shortly after, ‘Mdama discovers a portal that will allow him to escape the Sharpened Shield, and forces the Huragok to remove his harness lest he set it off and destroy the Forerunner technology. He then activates the portal. He is transported to an isolated Sangheili world, and convinces the locals to allow him to contact Sanghelios. He learns that his wife was killed, and believes that humans were responsible. He swears to discover the location of Requiem, awaken the Didact and use his anger to gain vengeance on humanity.